Despite director Park Chan-wook’s previous involvement with vampires (Thirst), his American debut has nothing to do with Dracula writer Bram Stoker. Instead India Stoker (Mia Wasikowska) is a teenage girl mourning the death of her father Richard (Dermot Mulroney) after a mysterious car accident. Working from a script by Prison Break star Wentworth Miller, which made the 2010 Black List for the best unproduced scripts, Stoker is an unusually intense slice of American Gothic. 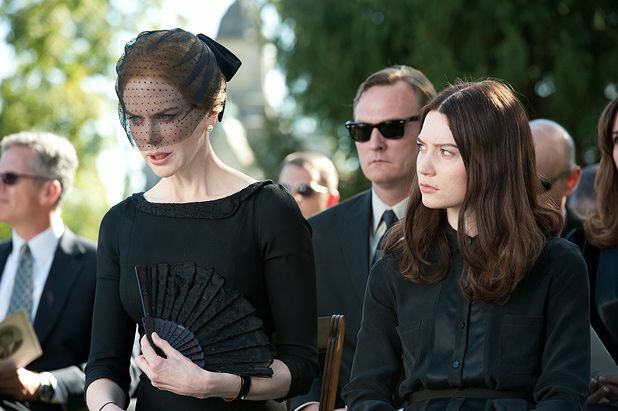 Although the brooding air of suspicion that permeates the film recalls Alfred Hitchcock’s 1943 film Shadow of a Doubt, complete with its own dubious Uncle Charlie character, Stoker’s macabre poetry is more in line with Chan-wook’s famed Korean output, notably Sympathy for Lady Vengeance and Oldboy. Indeed, the tangled mop sported by Wasikowska in her wilder moments recalls the grizzled appearance of Choi Min-Sik in Oldboy; the primness of her Alice in Wonderland role is forgotten in a breakout performance that crackles with repressed sexual tension. Neither dealing with the supernatural nor particularly violent, Stoker might not appeal to horror fans, but manages to create something fresh in the thriller genre. A repeated image of flowers with their leaves splattered in gore sets the tone; Stoker mixes beauty and blood to shocking effect.